Gas pipeline pipes are normally 12 meters in length but these ones for a gas field in Oman were 18 meters long , each measuring 90 centimeters in diameter and weighing 8 tons. Special lifting equipment had to be designed for safe off-loading and loading. 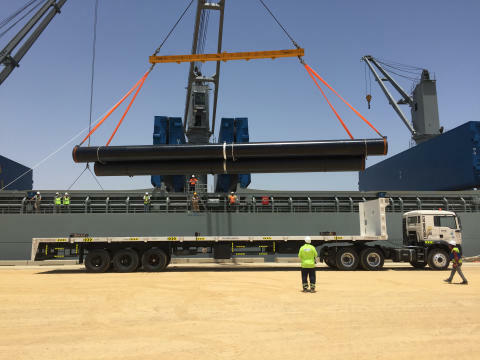 Specific beams that were brought in from India were required for the vessel discharge in Duqm.